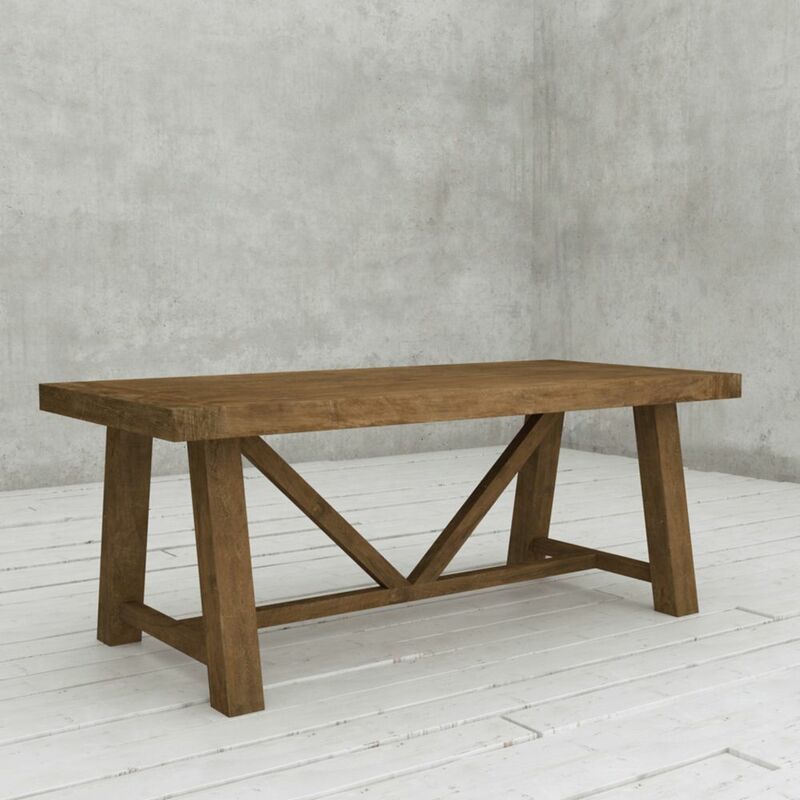 The Andora 78" rectangular dining table from Urban Woodcraft exudes farmhouse charm with its natural wood construction. Handcrafted from reclaimed teak and pine wood with a rich cafi noir finish, this transitional piece shows off clean-cut yet dramatic details in its thick breadboard top and substantial leg proportions. Gather six of your favorite family members and friends together for the ultimate elegant dinner they won't forget. The Jackie dining table is the perfect piece to center your dining area and draw everyone in to create memories and laughter around the table. Slightly splayed legs, a smooth finish, and clean silhouette, this table is crafted to perfection and built to last and will undoubtedly host the people you love for years to come. Channel your inner Martha Stewart and host like a natural, with the Payson dining table, a prime entertaining piece and mainstay for any dining space. Dress it up with a chandelier overhead, elegant chairs, and the perfect tablespace. With seating for eight lucky family members or friends, and a 4mm glass table top, your table will always stay full and protected. Brunch and dinner will take on a whole new meaning, with this transitional style, bringing laughter and memories to your table. 78 Inch Andora Dining Table Café Noire The Andora 78" rectangular dining table from Urban Woodcraft exudes farmhouse charm with its natural wood construction. Handcrafted from reclaimed teak and pine wood with a rich cafi noir finish, this transitional piece shows off clean-cut yet dramatic details in its thick breadboard top and substantial leg proportions. 78 Inch Andora Dining Table Café Noire is rated 5.0 out of 5 by 1. Rated 5 out of 5 by MelodieC from I love my new table! Solid, beautiful piece of work. I love this table. Perfect for our large family!